If you are a Trader, then here is a good news for you from Angel Broking. Now Angel Broking is introducing Angel i-Trade Plan with Rs.15 flat brokerage per order for order size upto Rs.50000 and only Rs.30 flat brokerage per order for order size above Rs.50000. 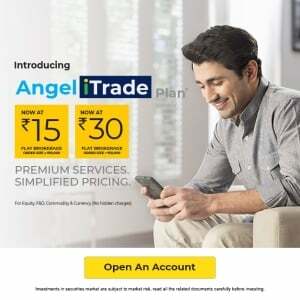 Angel Broking iTrade Plan is applicable from April 2019 onwards. Get a Call back from Angel Broking . Apply For Angel Broking iTrade Now. This plan is applicable for trading into equity, future and options, commodity and currency. Also there are no hidden charges. Earlier the the daily traders had to look for various discount brokers for cheaper plans for intraday trading. Now Angel Broking has come up with angel I trade plan which gives a big relief to daily traders.